Clemens Gadenstätter (born 1966, Zell am See/Salzburg) studied Composition with Erich Urbanner (University of Music and Performing Arts Vienna) and Helmut Lachenmann (1992-1995, University of Music and Perfroming Arts Stuttgart) as well as he studied the flute (University of Music and Performing Arts Vienna) with Wolfgang Schulz. During his student years, he was active as a flautist in numerous ensembles and orchestras (including with Klangforum Wien from 1989-92). 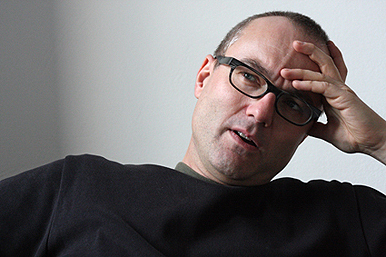 In 1990, he and Florian E. Müller co-founded the ensemble neue musik – wien, which performs a wide variety of new works, including ones involving intermedia. The the SWF Baden-Baden (Donaueschinger Musiktage 2001, 2005, 2012), the Musikbiennale Berlin, the Wiener Konzerthaus-Gesellschaft, the Salzburg Festival, the Festival Musik der Jahrhunderte Stuttgart, the Festival Vienna Modern, ORF, Musikbiennale Salzburg, the festival Steirischer Herbst, the Neue Vocalsolisten Stuttgart, the Ensemble Asamisimasa, the Ensemble Instant Donné, the Ensemble Nikel, the Klangforum Wien, the Ensemble Recherche, the Ensemble Modern have commissioned works from him. Among the conductors of his works are Peter Eötvös, Peter Rundel, Arturo Tamayo, Beat Furrer, Pascal Rophé, Johannes Kalitzke, Sian Edwards, Dennis Russell Davies, Patrik Davin. Several Orchestras as RSO Vienna, SWR Orchestra Freiburg and Baden Baden, Hilversum Chamber Orchestra, RSB Berlin, Philharmonie Luxembourg etc. have performed Gadenstätter’s Works. Among his awards are the Arbeitsstipendium from the city of Vienna (1987, 1994), a prize at the Forum junger Komponisten (1992), the Staatsstipendium der Republik Österreich für Komposition (1993, 1999), and the Jahresstipendium des Landes Salzburg für Komposition (1995). More recently, he has received the Publicity-Preis of the SKE-Fond (1997), the Förderungspreis from the City of Vienna (1997) and the Erste Bank Preis (2003), the DAAD “scolarship berlin artist in residence” 2006, Würdigungspreis of the City of Vienna. Gadenstätter’s works have been heard elsewhere at Darmstädter Ferienkurse für Neue Musik, the Donaueschinger Musiktage (2001, 2005, 2012), Ultraschall Berlin, Moving Sounds Festival New York, Festival Ultima Oslo, Nuovi Spazi musicali, Forum junger Komponisten (Cologne, Dresden, Leipzig), the ISCM World Music Days (Stockholm), Musica Nova (Sofia), and Seachange (Aberdeen, which also featured a portrait concert in 2001). From 1995 to 2000 Gadenstätter was the editor of the twice-yearly music journal „ton“, which was published by the Austrian section of ISCM. Since 2007 he is co-editor of the book series „musiktheorien der gegenwart“ (published by Pfau/Saarbrücken). Gadenstätter contributed to the organisation of various concert series and New-Music-Events. In 2000 he also curated the six evenings festival „salon13“ (together with Lisa Spalt). In 2000 he published „tag day. ein schreibspiel“ with Lisa Spalt (edition gegensaetze). He has also written essays that have appeared in numerous publications. Lately he worked on the banal (works: „Semantical Investigations 1&2“; essay: „What does banal really mean?“), on the polymodality of hearing („platzen/bersten“ for violoncello and piano, „häuten/schlitzen“ for string quartet, „ES“ – minimal opera for voice, video and ensemble etc.) as well as on the musical iconography (works: „ICONOSONICS 1-3“). Since 2003 Gadenstätter teaches as a professor for music theory , analysis and composition at the music university, Graz. He also works there as an associate professe for composition. In 2013 Clemens Gadenstätter teaches as a guest professor at the Hochschule für Musik Carl Maria von Weber in Dresden. In 2013 he is also a lecturer at „impuls. 8th International Ensemble and Composers Academy for Contemporary Music“ (9th to 20th february) and at Ung Nordisc Musik/Nordic Music Festival in Oslo.